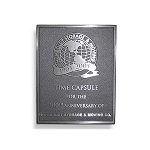 Do You Want a Plaque or an Engraved Time Capsule? Or Both? You don’t place a time capsule every day. So, when you do, it’s good to know what you want and what you need. Do you need a plaque? 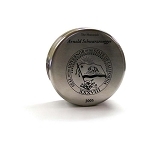 Do you need the time capsule lid to be engraved? Or do you want both? This article discusses the difference between the two methods of getting your time capsule message out there. 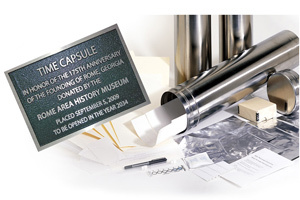 While the time capsule is your real message to the future, how do you identify it and what you want done with it? 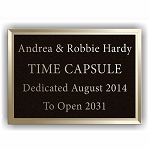 If you intend to bury your time capsule, you will need a plaque. 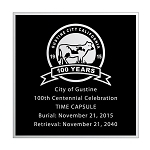 If you place the time capsule inside of a wall or cornerstone, you will also need a plaque. 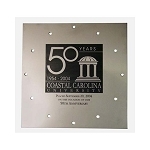 A plaque such as we provide is of outdoor quality, of bronze or aluminum, and lasts a lifetime or more. Such a plaque lets future community members know that you intend the time capsule to be opened at a certain date. But most importantly, a plaque marks the spot where the time capsule is located. You do not want the time capsule to be lost. 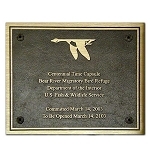 Our outdoor plaques (such as cast bronze or cast aluminum) are made at the foundry. The metal is poured into a mold. You provide us with the message you want, and our graphics team puts it on a proof for you to approve. You also call out things like color of the background, type of metal (aluminum or bronze), border style and mounting method. We call this the specifications sheet. We need your approval on both before we submit to the foundry. Once we submit, the plaques take about 3 to 4 weeks to make before they ship to you. Engraving a time capsule is different. Just like a plaque, it allows you to place a message to the future. But because it’s embedded into the time capsule’s metal forever, it marks the time capsule with your message. Some who place time capsules on display or in an archives area may wish to engrave the time capsule with their message. In these instances, they may not need a plaque. To know the intentions of the placers, however, an engraved message is ideal. Otherwise, it’s just a box sitting on display. As time goes by, people will forget about it. An engraved time capsule lid is special! Our laser process makes your logo image and message in black with the natural silver background color of the stainless steel. The recipients of your time capsule items can use the lid as a plaque or display later, or you could make the message on it timeless. In this way, the time capsule can be re-used again and again. 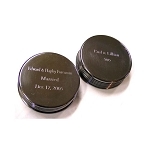 Only laser engraving is available for our stainless steel boxes, whereas the family time capsules can be engraved with either the laser or a diamond drag method of simple engraving. The simple engraving is limited to a few fonts and no logos can be done. Please allow 2 weeks’ time to your order to allow for the engraving process. We’ve chosen some various plaque sizes and time capsule combinations for our ‘packages’. All packages include 3 things, the time capsule, a matching preservation kit for protecting the items inside, and an outdoor quality aluminum plaque. You can upgrade the metal to bronze easily as an option. You can also choose most of the specifications as you order the package. If you want both engraving and a plaque, you need to add it separately. Place the package you want in your cart. Then look at the size of the lid on the time capsule you've chosen. Now go to the engraving area for the time capsule box or family time capsule cylinder. Find the size that matches your time capsule, and follow instructions for the engraving! Future posts will show more examples of wording for cast plaques and engraving. If you need further information, please contact our office. Click on the item to see available options - do not add it to your cart yet! Allow 1 week for this option.